Natto (DC-15) is a type of Natto bacillus. It is commonly used in Korean Natto (called Cheonggukjang) production. From our study, it was found that DC-15 Bacillus produces α‐Glucosidase inhibitory substances through fermentation of cereals including soybean and wheat. This characteristic nature of DC-15 Bacillus is very unique. 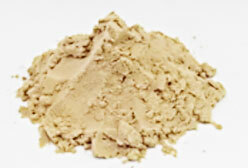 Our DC-15 Bacillus Extract Powder is produced through fermentation, extraction and powderization. It has strong α‐Glucosidase inhibitory activity and suppresses blood glucose elevation after meals as well as weight control by inhibiting calorie absorption. It is an ideal ingredient for nutritional supplements and foods. α-Glucosidase is sugar degrading enzyme which is found in small intestine. It decomposes carbohydrate to glucose. Starch and sugar are digested and absorbed by body through the process. These metabolism process are, however, inhibited by DC-15 Bacillus Extract blocking α-Glucosidase activities. DC-15 Bacillus Extract Powder contains 1-deoxynojirimycin (DNJ) and shows high α-Glucosidase Inhibitory Activity. The characteristic odor of Natto is minimized. The inhibitory activity is not debased by heat. Therefore, all together, the DC-15 Bacillus Extract Powder can be used in bakery and noodle applications as well as nutritional supplements. Caution：1-Deoxynojirimycin (DNJ) is an API and could not claim its content on product label in Japan.